We’re giving away a bunch of pairs of movie tickets to see Prisoners at a participating theater of your choice. To enter, send us an email with your full name and address and tell us your favorite vengeful movie dad. Winners will be chosen at random, only one entry per household please. 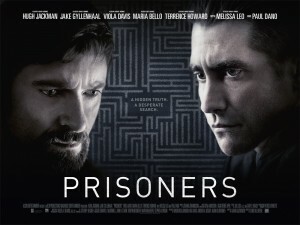 PRISONERS, from Oscar(r)-nominated director Denis Villeneuve, stars Oscar(r) nominees Hugh Jackman and Jake Gyllenhaal in a story that poses the question: How far would you go to protect your child? Keller Dover (Jackman) is facing every parent’s worst nightmare. His six-year-old daughter, Anna, is missing, together with her young friend, Joy, and as minutes turn to hours, panic sets in. The only lead is a dilapidated RV that had earlier been parked on their street. Heading the investigation, Detective Loki (Gyllenhaal) arrests its driver, Alex Jones (Paul Dano), but a lack of evidence forces the only suspect’s release. Knowing his child’s life is at stake, the frantic Dover decides he has no choice but to take matters into his own hands. But just how far will this desperate father go to protect his family?